Lately, the road renovation and upgrading project of the Wuxiang New District Headquarters Base was basically completed. The renovation of over 20 roads improved the city image. The project is of great importance to serve the 60th anniversary of the founding of Guangxi Zhuang Autonomous Region, improve special urban characteristics and better the investment climate of Wuxiang New District. 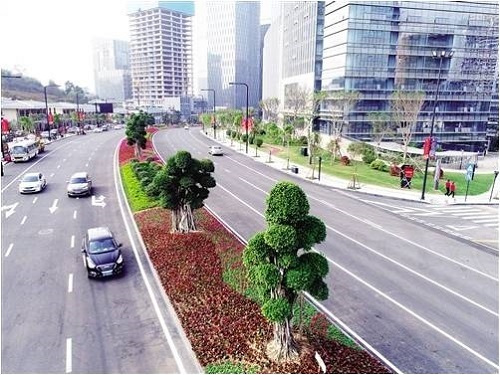 It is learned that the planning area of the project covers all the enclosed roads by Pingle Avenue, Wuxiang Avenue, Tiqiang Road and Qingge Road. The total area of used land is 2.59 square kilometers with 475,900 square meters for road construction and renovation and 181,200 square meters for greening.